Whether it's your boyfriend, brother, father, friend, or husband, the gifts I've chosen can be given to any one of the aforementioned parties! I also tried to stay away from the standard cuff link, dress shirt, shaving set, socks, etc. type of gifts. Finally, I let my boyfriend and some guy friends preview this post in order to obtain their approvals before posting. 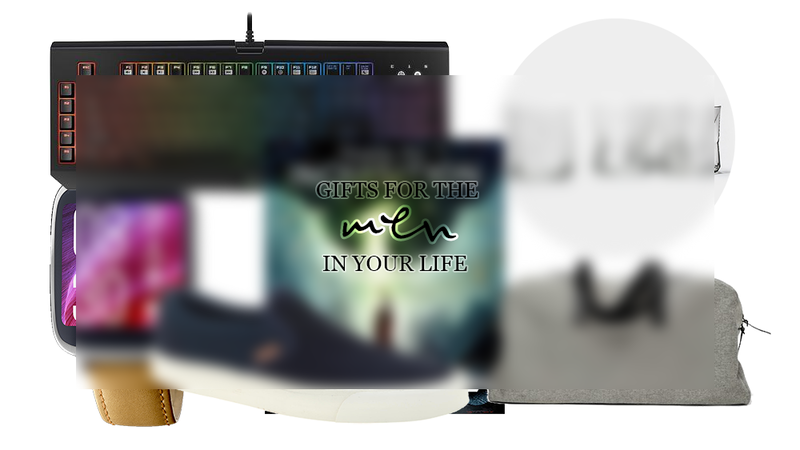 So, I'm glad to share this male approved gift guide for you all! 1. Razer Chroma Mechanical Gaming Keyboard: Being quite a video-gamer myself, I know that the type of keyboard you have when you play games on the computer is very important. This Razer Chroma keyboard has many features, including the option to customize the back-lighting of each individual key! It's the perfect gift for any PC gamer. Feeling generous? Get him the matching gaming mouse as well! 2. Everlane Weekender Bag: A highly versatile bag that can be used as a gym bag, traveling bag, school bag, or work bag. Comes in more color options, and will never go out of style due to its classic silhouette. 3. Dragon Age Inquisition: As I mentioned above, I actually play quite a lot of video games! If you're not in the know about the latest and greatest video game, look no further, Dragon Age Inquisition is the most recent biggest game release. Available on all the latest gaming platforms including PC (Windows), PS4, PS3, Xbox one, and Xbox 360. 4. Asus Zen Smart Watch: One of the latest trends in technology right now is "wearable tech." Currently, smart watches have been hitting the market and they're made to work with your smart phone. Your giftee will have all the latest notifications from their phone show up right on their wrist, plus tons of more features. 5. Blade Runner Faceted Whiskey Glasses: You don't have to be a fan of the sci fi classic movie to like these whiskey glasses. They're great to look at all on their own. Available in clear glass or a smoked glass. You get a set of four for only $25. 6. Vans Blue Suede Slip-Ons: Who wouldn't appreciate new shoes? These blue suede ones for Vans are fashionable and different from traditional Vans slip-ons.